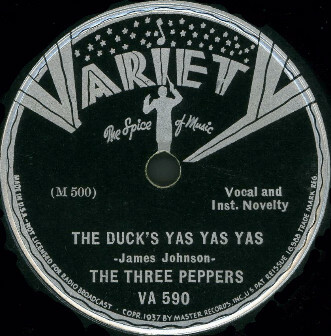 "The Duck's Yas Yas Yas"
Above: Photos of The Three Peppers. 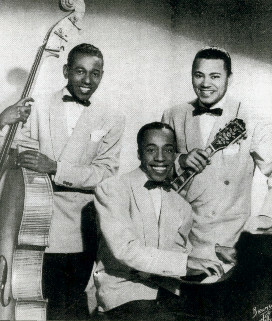 (L-R) Walter Williams, bass fiddle; Roy Branker, piano; and Bob Bell, guitar. Above: Label for Variety 590 released in June 1937. Both sides were recorded on 5/27/37. This was the third of five by The Three Peppers on Variety. It was reissued on Vocalion 3803 in October 1937. A different version of the flip, "Swing Out Uncle Wilson" (composed by Bob Bell), was released on Decca 2557 in 1939. 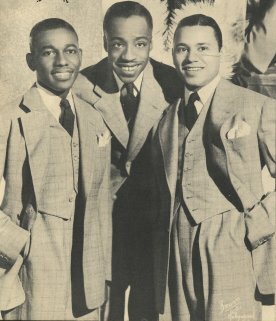 The Three Bits Of Rhythm released their version of "Yas Yas Yas" in 1946. A) Click on an option below to listen to The Three Peppers using Streaming RealAudio. B) Click on an option below to listen to The Three Peppers using Downloading RealAudio.